No campfire required for these S’mores! 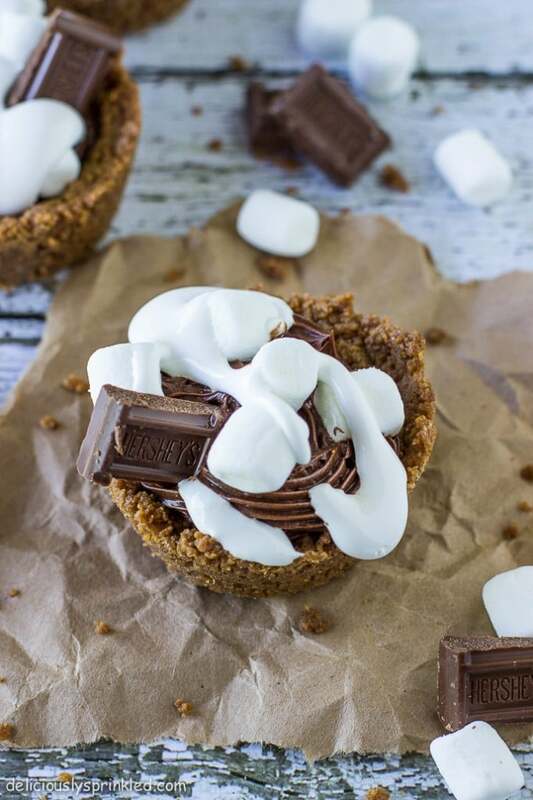 Now, you can enjoy the delicious taste of traditional s’mores with these easy, less messy S’mores Cups. Perfect for when you have that craving for the graham cracker, chocolate, and marshmallow-y treat but don’t have a campfire or it’s just way too hot outside to sit by the fire. The ingredients are simple and you probably have all of them already in your pantry or at least most of them! You will need graham crackers, powdered sugar, melted butter, chocolate whipped frosting, mini marshmallows, marshmallow creme, and snack size Hershey bars. Or any other fun toppings you want to add to these cups, like mini M&Ms, nuts, caramel sauce, SPRINKLES…the options are endless. 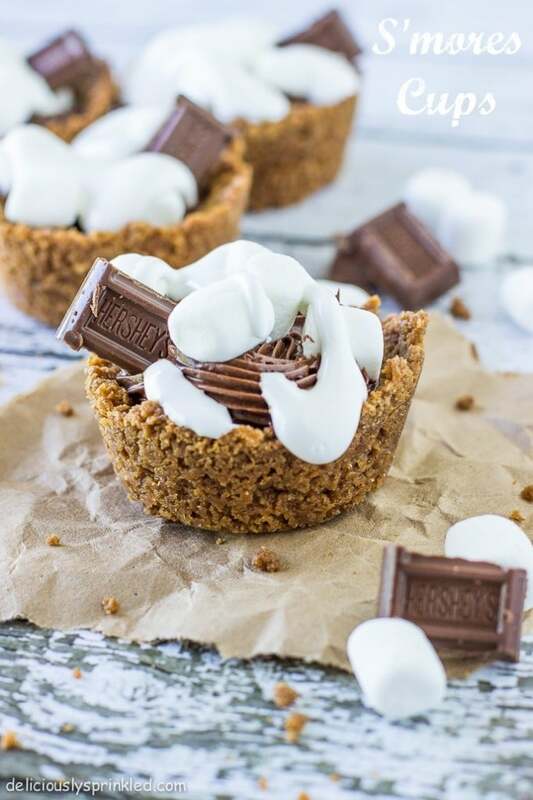 I know I will be making these at least a couple times this summer, everyone loves s’mores no matter if they are over the campfire or in these cute little cups. Enjoy! Make sure spray each cupcake tin with a generous amount of non-stick cooking spray to ensure the graham cracker cups with pop out easily once cooled. 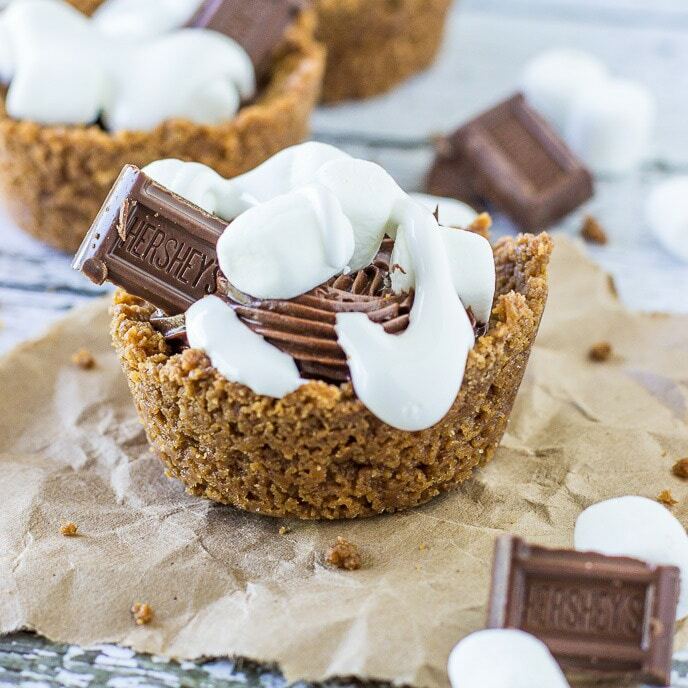 You can also use the tip of a knife to CAREFULLY pop the graham cracker cups out of the cupcake tin. Preheat oven to 350F degrees. Spray 12 count cupcake pan with non-stick cooking spray. Set aside. Using a food processor, place graham crackers, powered sugar, and melted butter into processor. Process on high until the graham crackers are finely chopped. Press graham cracker mixture evenly into the bottom and up the sides of each prepared cupcake tin using the back of a cookie scoop or with your fingers. Bake for 15 minutes or until light brown. Let cool completely. Once cooled use a knife to pop them out of the cupcake tins. Spoon whipped chocolate frosting into a piping bag (I used a Wilton 1E tip)or a storage baggie. Pipe frosting into each graham cracker cup and top with (5) mini marshmallows and place a piece of the Hershey chocolate bar into the frosting. Spoon tub of marshmallow creme In a small microwaveable bowl, microwave marshmallow creme for 30 seconds, stirring until creamy. Pour marshmallow cream into a storage baggie, cutting a small hole at one end of the baggie. Drizzle over top of each smore cup. Serve and enjoy! Jenn these seriously look incredible. I love s’mores! We were totally on the same wave length with our little s’mores cups!! 😉 These look fantastic!! Perfect for popping all night long! Can I use a blender to crumble up the crackers if f i don’t have a food processor? These are so cute! They’d be great for a picnic or potluck! Jenn, these are so much fun!! Love S’mores, and having them in bite size form could be dangerous! Now you have me craving S-mores! I want MORE! You have no idea how much I LOVE s’mores!!! I would LOVE these! This would be such a perfect recipe for parties. YUM!!! Looks amazing. I am a huge fan of all things s’mores. S’mores are such a great campfire (and any day of the week) treat. I love how you’ve changed it into a cup cookie. I could use veggie marshmallows and dark chocolate to make this a delicious vegan treat too! Thanks for the inspiration! These almost look better than real s’mores! Love having campfire s’mores in all different forms! So good! Loving the flavors of a smore in an adorable little cup! Too cute, Jenn! Oh yum! Especially with that chocolate filling. Such a fun way to enjoy one of favorite summer treats! I have been making s’mores recipes left and right lately!! Love it!! These look so delicious! Perfect for the summer time! Bite size anything are a moms best friend, kids love them! Very cute! Could these be any more beautiful?! A campfire in a cup! adorbs! These are fantastic Jenn! What a fun way to enjoy S’mores 🙂 Pinned! What a fun way to enjoy s’mores! My 5 year old son would love these. He just discovered the fun of s’mores the other day and now is loving anything s’mores related. Oh goodness, pure deliciousness. Love it Jenn! Totally cute. Totally want them! These are too cute and such a great recipe for summer! Who doesn’t love a classic s’more? !